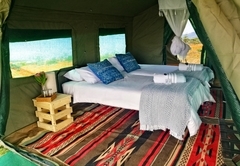 Valid 16 August to 8 September 2019: 5% discount on standard rates, on stays of 3 nights or longer. 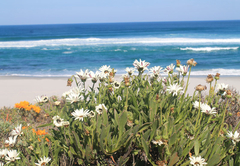 Namaqua Flower Beach Camp is one of the highly recommended Kamieskroon guest houses and provides accommodation in 15 guest rooms for tourists visiting the Namaqualand region. 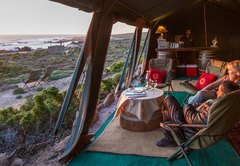 An oasis for rest and relaxation right on the beach during the magnificent flower season, Namaqua Flower Beach Camp is truly an extraordinarily memorable occasion. 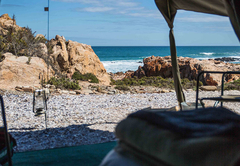 Dream, discover, explore Namaqua. 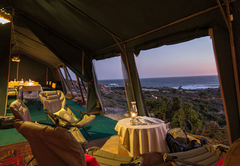 Experience the comfort, relaxation, and convenience of a private mobile tented camp, right on the beach, under skies which seem to stretch as far as the eye can see. 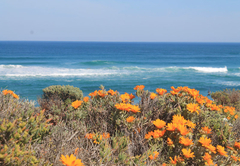 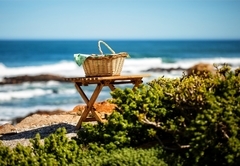 Namaqua Flower Beach Camp is situated 1 km north of the Groenrivier entrance to the Namaqua National Park and offers guests a fully catered luxury accommodation experience during the flower season - a true oasis of rest and relaxation. 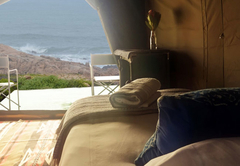 Twelve ocean-facing luxury canvas dome tents equipped with beds, soft comfortable duvets, comfy blankets, electric blankets and electric lights to ensure that you wake up refreshed and completely rejuvenated. 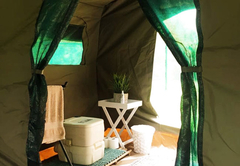 Furthermore you can enjoy the privacy and convenience of your own hot shower and spacious dressing room and a chemical flush toilet. 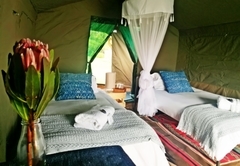 Fully serviced en-suite bedrooms are set up in 15 Cottage Tents. 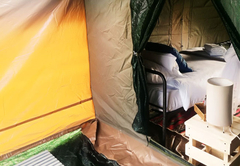 Each tents is equipped with beds, comfortable duvets, cosy blankets, electric blankets and electric lights to ensure you wake up refreshed and rejuvenated. 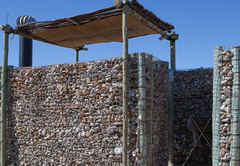 Ablutions include hot showers and chemical flush toilets (porta-loos), luxury amenities and towels. 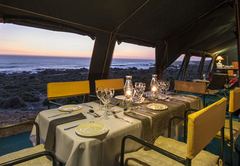 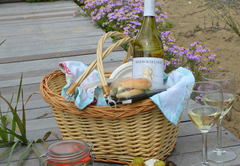 Namaqua Flower Beach Camp is renowned for its delicious dining experience - sea breezes combined with the aroma of bacon and eggs, delicious and wholesome picnic baskets, high tea, mini cheese boards and last but certainly not least hearty, satisfying dinners prepared in our remote kitchen by a private Chef. 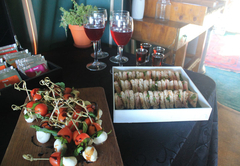 Guests can enjoy a nightcap in the lounge after dinner before retiring to their warm beds. 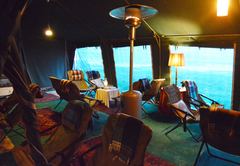 Guests awake to tea and coffee served right outside their tents to start their day. 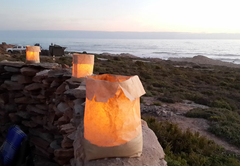 After a superb evening around a dinner table guests can then enjoy a nightcap in the lounge before retiring to the chorus of the ocean. 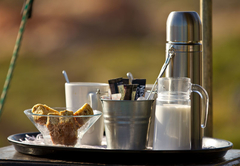 Guests will awake to tea and coffee served right outside their tents as they laze dreamily at the start of the day. 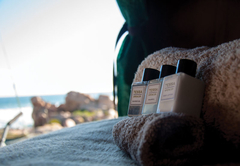 Comfort and simplicity ensure that you wake up refreshed and completely rejuvenated. 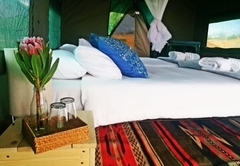 Elegantly and beautiful decorated, we believe this is far more than just another rustic camping experience ... its an oasis for rest and relaxation. 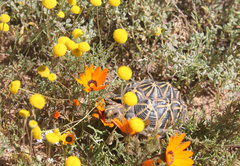 Every year nature performs a miracle in the Northern Cape, sprinkling natures confetti as far as the eye can see. 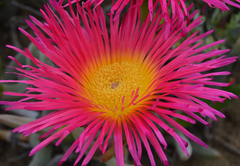 The seasonal winter rains trigger one of the most spectacular floral kingdoms, a truly breathtakingly beautiful phenomenon, which is quite possibly unlike anything you have experienced before. 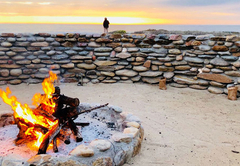 Succumb to an oasis for rest and relaxation at the Namaqua Flower Beach Camp located right on the ocean just one kilometre north of the Groenrivier entrance to the national park. 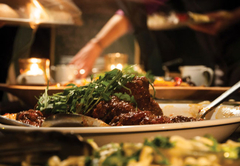 An extraordinarily memorable occasion. 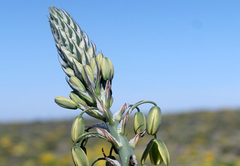 We have had the rare and marvellous privilege of seeing the sun rise and set over Namaqua for many years. 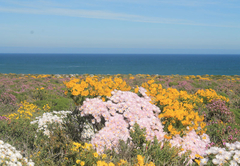 Flower season in Namaqua is a breathtakingly beautiful phenomenon and indeed one of the most spectacular floral kingdoms in the world. 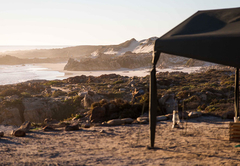 Join us 12 August and 18 September for an experience of a lifetime. 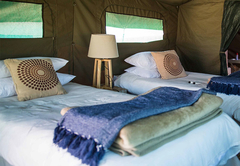 Fifteen luxury canvas dome tents are equipped with beds, soft comfortable duvets, hot blankets and electric lights to ensure that you wake up refreshed and completely rejuvenated. 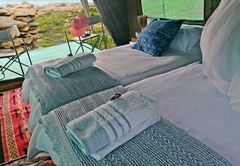 We had a wonderful 2 nights here - relaxing and beautiful spot.